After spending four grueling years in high school working towards a dream college, the last thing you’d expect in your email is a rejection from college you thought would be an easy acceptance where you surpassed all of the criteria. However, seniors this year have felt it more than ever, with rejections from both top and safety schools. 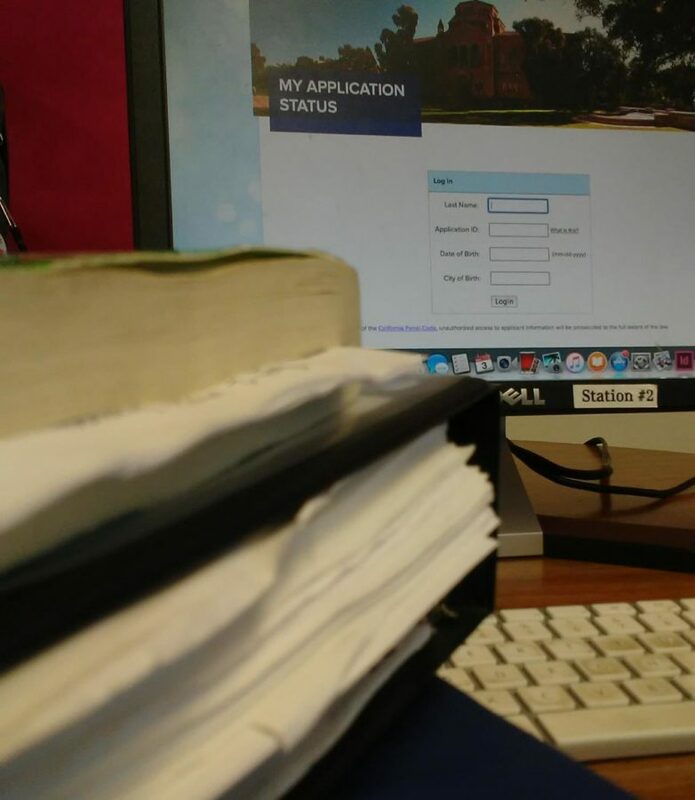 Now, even with SIRs (statements of intent to register) submitted, many remain hopeful on the waitlist or are committed to schools they weren’t planning on attending before. “Each year, over the last decade, UC Berkeley has experienced significant increases in the number of applications received. Because the number of freshman enrollment spaces has remained relatively constant, admission to Berkeley has become much more competitive, this year was no exception. For fall 2018, we received more than 89,000 freshman applications,” UC Berkeley said in their admission frequently asked questions. Colleges like UC Berkeley are among some of the most desired across the nation, and the increase in applicants meant that more bright futures were deferred simply because of space limitations. This means that students will have to be even more competitive and even more involved to fight for the same spot that was more available a few years ago. “They’re getting eclipsed with someone who is an Olympic hopeful, someone with multiple patents, published authors, and even a lot of those kids aren’t getting in,” Irena Smith, an independent college counselor said. “But I was more qualified than anyone. Why didn’t I get in?” many ask themselves. But the answer to that is just as nonexistent as the spaces in UC schools. “Many parents, students and guidance counselors struggle to find a rational explanation to curb their disappointment. Even college admissions officers acknowledge a degree of arbitrariness in the whole process,” Karen Gross, former president of Southern Vermont College and former Senior Policy Advisor of the US Dept. of Education said. Xean Nguyenla and Willie Yeh are two seniors at Charter Oak who have felt that they have been cut short by this process. “I was vice-president of Key Club. I also maintained a really high GPA, one of the highest in the school, and I achieved all 5s and 4s on my AP tests. I believed that it would be enough to achieve my goal of becoming a UCLA Bruin. However, I was waitlisted. Although I understand that the competition was strong, I am somewhat confused and curious about what I would have had to do for that status to change,” Xean said. Xean says that he – and many other students – were more than qualified for admission. Of course, in college-season, the old question of bias comes up again. Xean and Willie are both male Asian American students pursuing a STEM major, three things that might discount their applications in the eyes of an admission officer. “I feel like it was somewhat odd because I heard people getting into the same major as I am pursuing, but with lower statistics, and I had more extracurriculars. I don’t know how they looked at it. Maybe there was a bias because it’s not always just one person reading the applications,” Willie said. A bias may be there, according to a 2010 Princeton study. “Measured on an all-other-things-equal basis, black applicants have an admission advantage compared with whites equivalent to 310 SAT points (on the old 1,600-point scale), while the advantage for Latino candidates is 130 points. Asian-American applicants face a disadvantage of 140 SAT points. This means that Asian students have to have an SAT score 450 points higher than otherwise similar black applicants to have the same chance of being admitted. Social class background matters too, but it matters less,” Thomas J. Espenshade, professor of sociology at Princeton University and Alexandria Walton Radford, research associate at MPR Associates in Washington, D.C.
Is it racial bias? Is it too high standards? Is it something more? “The admissions problems in the UC system are part of a larger problem, including the conundrum of how many out-of-state students public universities should enroll since these ‘outsiders’ pay more than in-state students. A shortage of seats also means that community college students in the system who expected to transfer to a four-year institution are finding their pathway thwarted, too,” Gross said. If you were one of these students, you’re not alone. Even David Hogg, who is currently a leader of the student gun control movement, was rejected from several UC schools and says he is taking a gap year to decide his future plans. If you’re like me, one of the UC hopefuls who has been preparing an entire high school career studying and doing extracurriculars just to get into a high-ranked school, know that with how selective the college process has been, you are MORE than an application, an acceptance, a waitlist or a rejection. When diversity, not merit, is the benchmark for admissions then Asian Stem students are up a creek without a paddle. Of course it’s bias. My son, who is 25% Japanese, was told to not put Asian on his application to Cal Poly because it would hurt his chances of getting in. If you believe that a high school education is just a step into a high ranking college, yes, you are just an applicant. If you don’t treat yourself as an individual, why high ranking colleges treat you so? Sorry, I do not buy this argument. The perceived “problem” is that many “Asians and Asian Indians students” primarily prefer UCLA and Cal over the other UCs. This “lack” mentality where you create a dearth of spots and then cry foul is not the way to play statistics. I am a substitute teacher and have seen how the college and career counsellors and regular counsellors work together with our students to assess needs and ensure that every student who chooses a community college track or a Technical school track or a 4 year college track are successful. As a reminder, there are 7 more UCs than the 2 mentioned above. Education is about “widening” our minds. Maybe the best place to start that process is to look at colleges with a wider lens.